This month we are singing “Wag Your Tail” from the Super Simple Songs “Animals” CD. All the Super Simple Songs are fun to sing and dance with. We really enjoy “Wag Your Tail,” and getting up and moving. Singing and dancing is fun! You should try it!! Today at story time our teacher read,”Mr. Brown Can Moo! Can You?” a book by Dr. Seuess. It’s a great book for us to practice our pronunciation, and it’s fun! 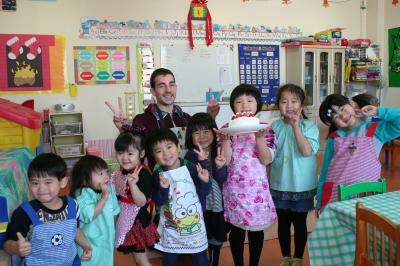 Today we had a birthday party for our friends who were born in January. We sang songs, played games, and made yummy hotcakes.Birthday parties are special for everyone here at Apple Bee.Happy birthday! One of our school songs this month is the nursery rhyme, “I’m a Little Teapot.” After having fun singing this song today, we made our own little teapots at art time. This is the way we wash our face… early in the morning. This is the way we brush our teeth… early in the morning. This is the way we comb our hair… early in the morning. 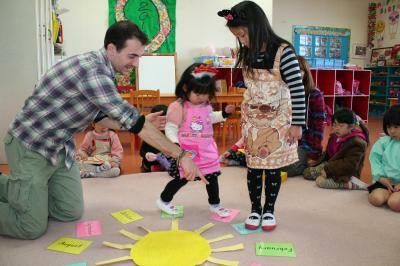 It’s a great way for we little ones to learn the way to say in English what we do every day! Sunday was a very special day for us. 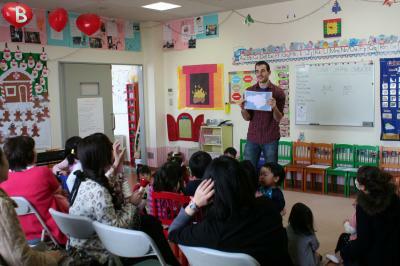 We had a nice party with our parents and teachers, then afterward we made yummy rice cakes.We love rice cakes. This week we are studying farm animals. 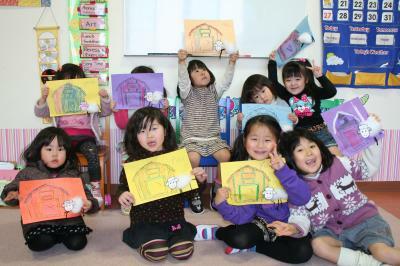 Among farm animals, sheep are very important; they help us with their hair and give us warm clothes to wear.Today we made pictures of sheep, and their bushy hair. 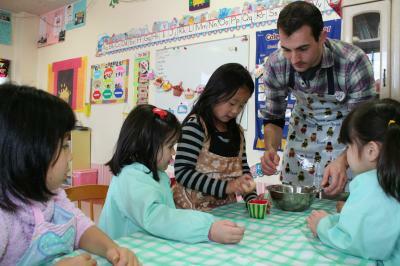 On Sunday, the Apple Bee family will be making rice cakes. 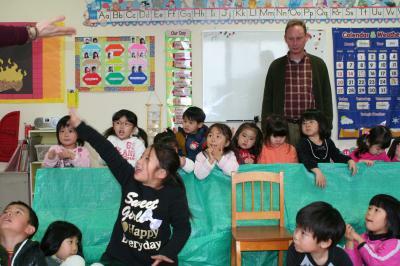 We are practicing play a play, “The Mice’s Rice Cake Party” every day with out teachers. 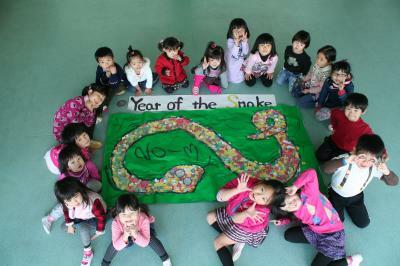 We hope to have a lot of fun this Sunday.We love rice cakes! The Jr. Step Test is going to be held soon. 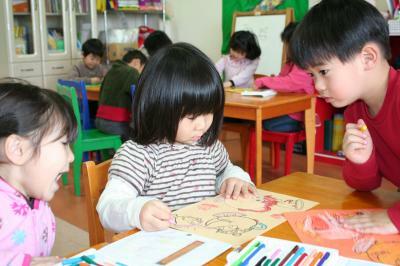 Our older kindergarten students are studying hard now. 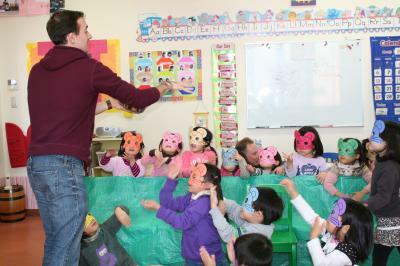 Our students like to study, learning English is fun! 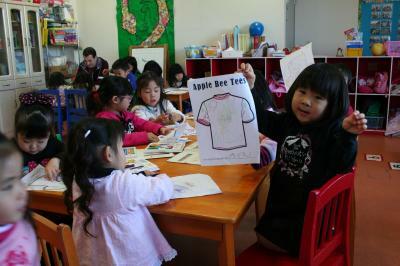 Today our teacher gave us a worksheet and asked us to design our own t-shirts. 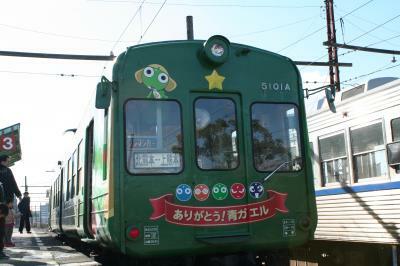 Today we rode on the Keroro train. 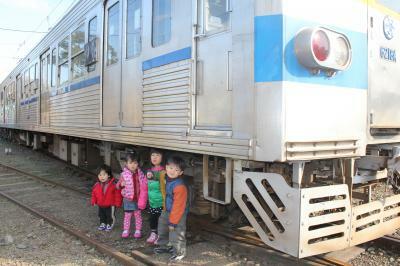 We caught it at Kita-Kumamoto station, and rode it to Kami-Kumamoto station. The train people were very nice to us. 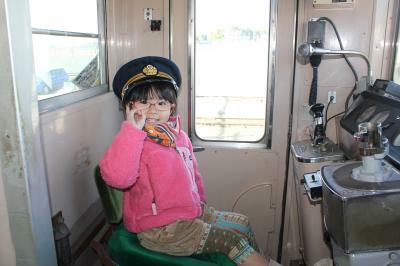 They took our pictures in the driver’s chair, and let us pretend to drive the train. We saw many things, this is a day we will never forget.Thank you everyone, we are so happy! Wednesday is work book day. Today we practiced writing numerals using our stencils. We’re getting bigger! Welcome back to Apple Bee! Today we started our third term, and we are looking forward to working hard and having fun the rest of the year. Today was our 3rd day of winter school. 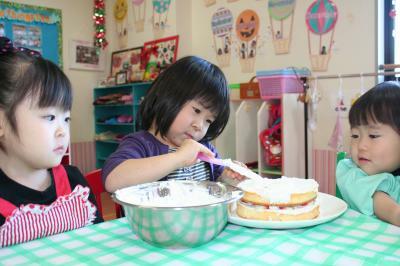 Today at cooking time we made delicious strawberry cake.